Is This Your Answer To Diversity? This was at the register at my local CVS. I have no idea what it says and I'm guessing that very few of the employees have a clue about what it says. 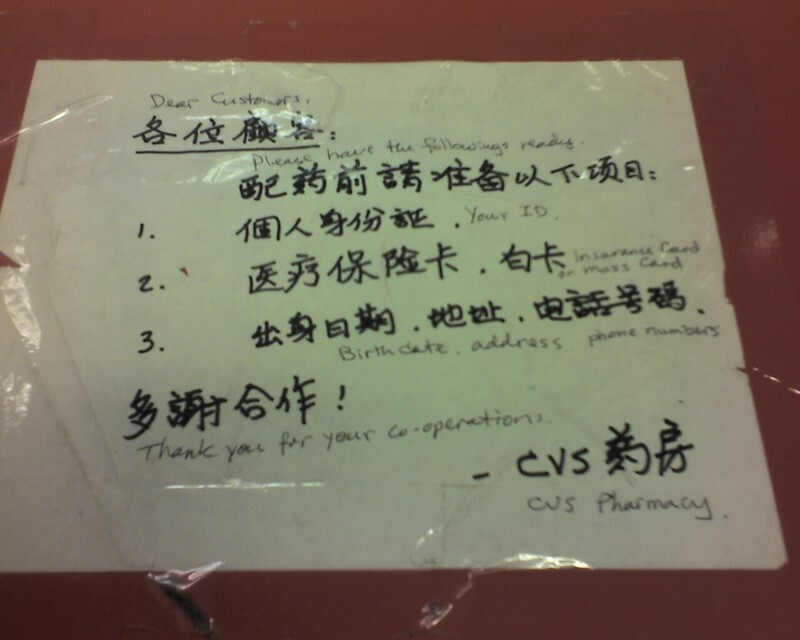 I am guessing that is says something that they have said over and over again to Chinese speaking customers and they finally found someone to write it down. 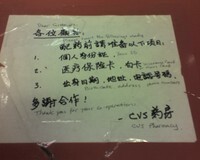 Here is what scares me...this sign is posted at the Pharmacy Register. You know, the one that the Pharmacist uses to ring up your expensive medication for diabetes and a candy bar at the same time. Don't get me started on having a $100,000 + employee ringing on a register in the name of "customer service"
Anyway, back to the sign. Does this really serve a multi-cultural customer base? If you need to post things in multiple languages, and I think that there are times you do, you've got to make sure it is correct in what it says, looks just like a sign in the dominant language, and keeps your brand. Even better, make sure your staff reflects the community it serves. I'll guessing that somewhere in this city there is someone who speaks the language and would like a job. What do you think the C.E.O. of CVS would say if he walked in and saw this posted at the register? I see an endocrinologist at Boston's world-renowned Joslin Clinic. And let me tell you, it the key staff wasn't so good, I would go somewhere else. Why? Because the world-renowned Joslin Clinic doesn't act like it is world renowned. Why do say this? The facility is dated, dingy, and poorly set up. They send letter to patients letting them know that their doctor is "too busy to see them this month--maybe next month"
So why do I go? Because they are still the best. Hand down, the best--for now. It crosses my mind that in Boston's very competitive health-care market there is a huge opportunity for a rival to come in and combine top care with pleasant surroundings and caring compassionate customer service. I recently read an article in Workforce Magazine about Syracuse New York's Crause Hospital. The hospital was on the verge of going under. What was once a well respected institution had fallen under hard times. So what did the CEO do? He asked middle management to "fix it". And they did. Is it good enough for your momma? If it is not--then you aren't meeting the standard of care. Who wouldn't understand that? Everyone from the custodial staff to the CEO can all agree that if what is happening is not what you would want to happen to your momma then it needs to change. I wish the Joslin Clinic would implement that same standard of care. I think it would transform the place--imagine how much you'll forgive a dated and dingy facility if the people inside are bright, cheerful, and committed. ...and oh how I would love to implement assessment testing to help them hire people who fit! In the March 2008 edition of Fast Company, here was a little article the fact that there are twice as many Chinese restaurants in the U.S. as McDonald's "an accomplishment all the more astounding because it has happened without a single corporate force plotting the dominance of egg rolls and friend rice. The article goes on to say that much of U.S. Chinese food "innovation" like chop suey, fortune cookies, takeout containers, delivery, and soy-sauce packets are uniquely American. I'm guessing that almost every small town in the U.S. has a Chinese Food restaurant. What is astonishing here is how Chinese Food has become a part of the fabric of our country. We don't think twice about ordering it (although if we really knew the calories/fat content we might). I think the only real exception to the lack of "corporate presence" lies with P.F. Changs. If you are not familiar with it, P.F. Changs is an "upscale Chinese bistro". It came here to Boston about five years ago after starting in of all places, Scottsdale, Arizona (you know, the desert mecca of Chinese food). They have brought consistency and English-speaking service to the American public but it does lack in true authenticity. However, for upscale Chinese food, it is good. As I was walking into the office tower where I work as an Outplacement Counselor, I overheard two of the building security guards discussing their personal hand guns. Who are you hiring and what are they saying out loud? At my company, we help companies hire the right people for the right job. Overly Tan - Overly Blond - Susan Powter-esq Woman: Do you have a Phone book? Helpful Banker: Yes, here it is. OT-OB-SPesq W: (after looking in phone book for several minutes) You're shitting me there isn't a tanning booth in the entire Back Bay? Helpful Banker: Sure there is. There are a couple on Newbury St. Just walk up to Newbury and turn left there's one between Exeter & Fairfield, on the left. OT-OB-Seesaw: Which end of Newbury St am I on? Helpful Banker: Well, you're on Dartmouth St, but when you get to Newbury you'll be right in the middle, just turn left and go up a couple of blocks. OT-OB-Seesaw: Which end is the Nike Store at? Helpful Banker: The Nike Store is on the corner of Newbury and Exeter, you will pass it heading to the tanning salon. OT-OB-Seesaw: It says in the phone book here that it's 339 Newbury between Exeter and Fairfield, so would I turn right or left on Newbury. Helpful Banker: Again, you walk up to Newbury St and turn left and walk up a couple of blocks. OT-OB-Seesaw: But are the numbers going up or down? Helpful Banker: They are going up from where you will turn left. It's just a couple of blocks up, you will pass Exeter St with the Nike Store on the left and before you get to Fairfield St, Tanorama will be on your left. OT-OB-Seesaw: Can I use your phone to call them and get directions? How does Starbucks do it? They are, in essence, a coffee shop and quick service restaurant. But, it can’t be ignored that Starbucks is an OK place to work. You see all walks of life behind the counter…hip urban kids, suburban moms, and out-of-work corporate executives. All smiling and serving coffee and bagels. You never see that mix of people at a McDonalds, do you? I’m guessing that the key is employment branding. You see, Starbucks is considered hip and McDonald’s is considered a McJob. You have to hand it to the Starbucks folks for creating a culture that fosters a fun place to work, a great product, and (in my opinion) a pleasant professional clientele. 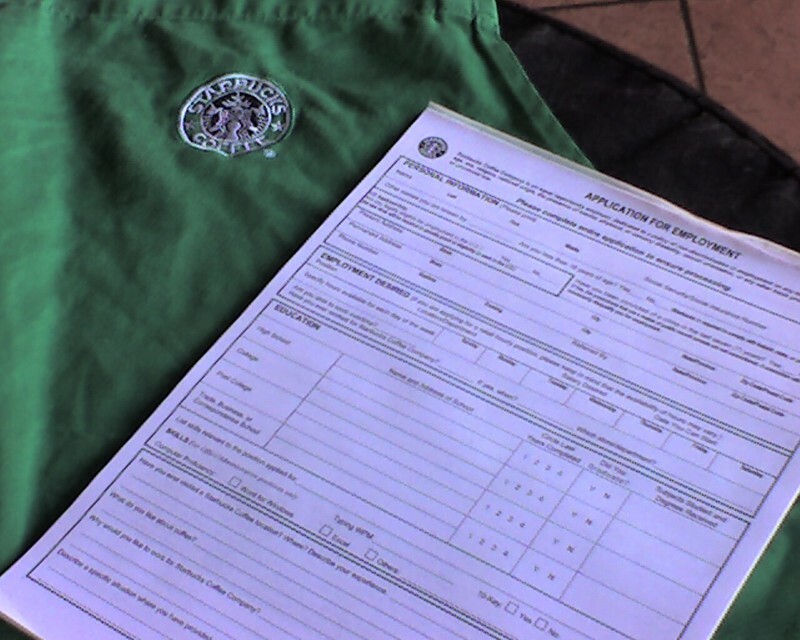 I’m also guessing that the fact that Starbucks seems to treat their employee’s in a decent way (read: health insurance) also goes a long way towards creating a great employment brand. So, what is your employment brand? Are you Starbucks or McDonald’s? It is O.K. to be either one but you need to know your niche and plan appropriately. Are you flexible and fun? Or rigid and stayed? You’ll attract people depending on your perceived brand. Oh, and if you are rigid and stayed, don’t put out a hip employment ad and expect hip people to apply. If they sense that you are being disingenuous, you’ll lose in the end.